Transport Terminal Architecture is always fascinating and inspiring learning subject for me in the journey of my architectural exploration and execution. 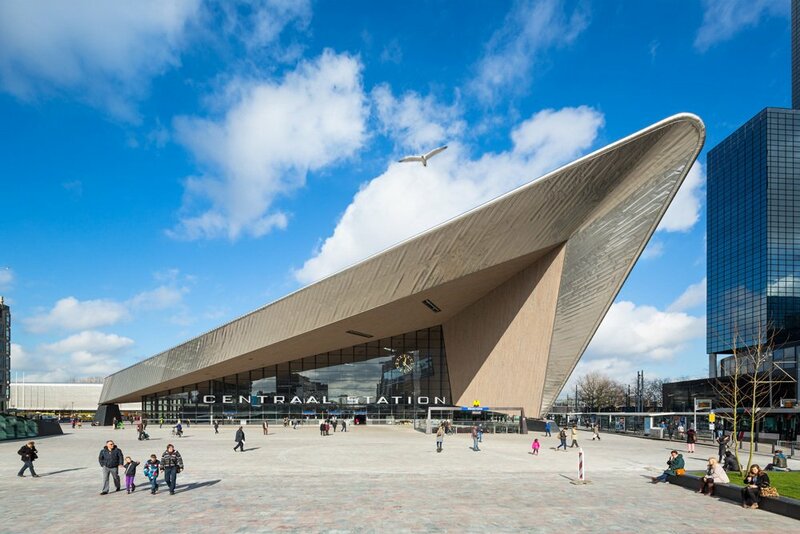 Rotterdam transport terminal architecture is recently completed contemporary architectural exploration in the category of transport terminal architecture. 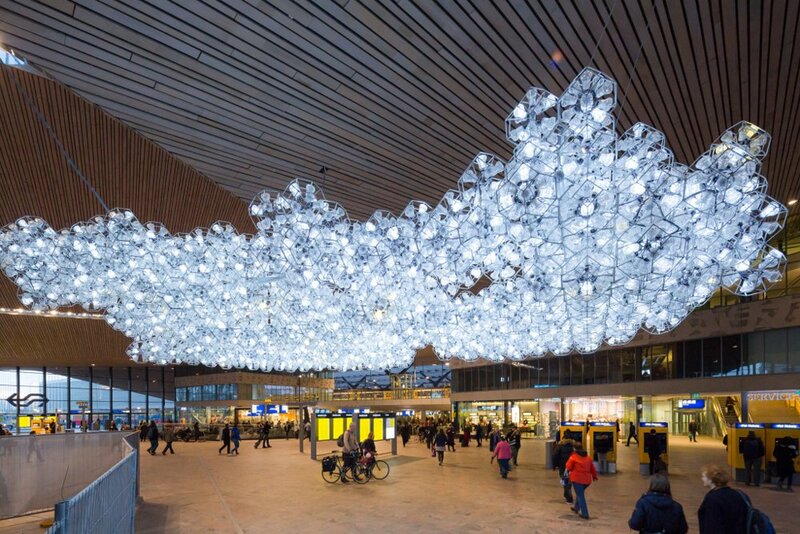 I would like to put some collective observation and analysis about Rotterdam central station transport terminal architecture and design with their visuals bellow for you. 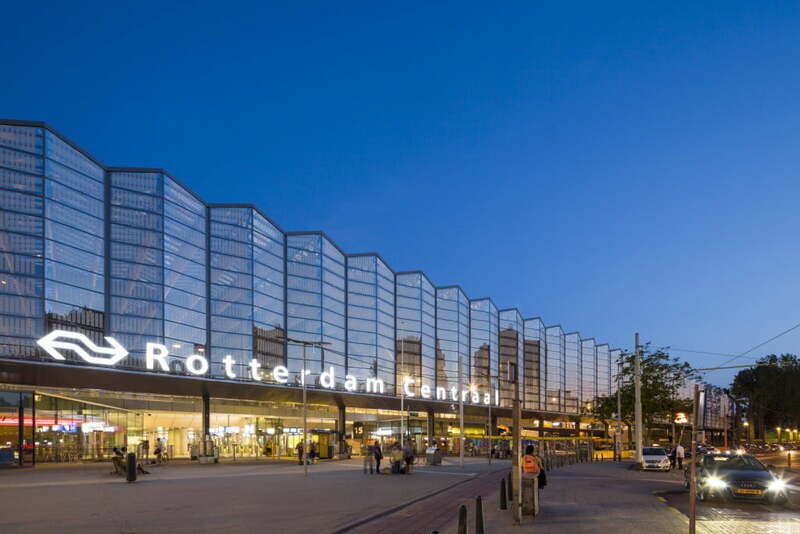 Rotterdam Central transport terminal architecture is one of the most important transport hubs in The Netherlands. 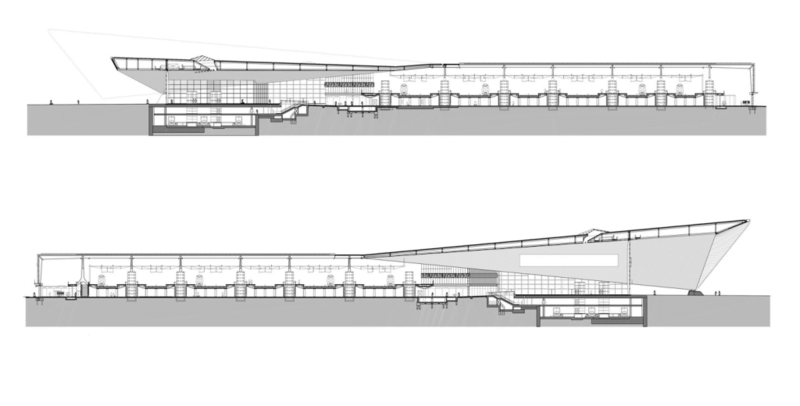 About Transport Terminal Architecture From the architect. 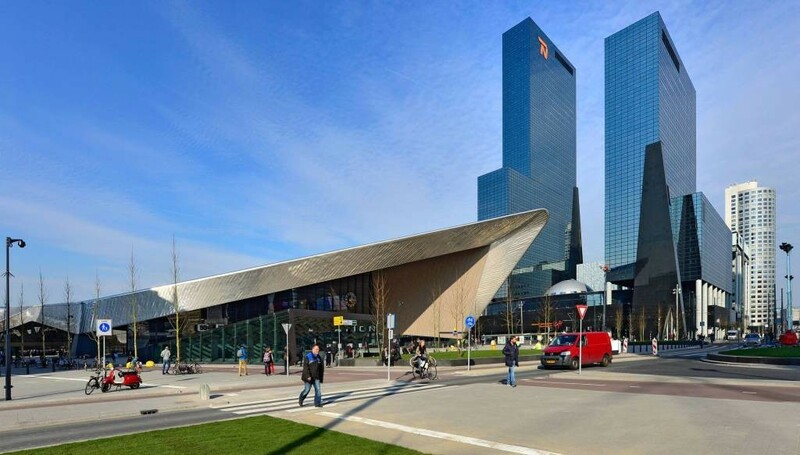 Rotterdam HST is the first stop in the Netherlands when traveling from the south and is strategically positioned in the middle of Europe, with Schiphol only twenty minutes and Paris a mere two and a half hours away. 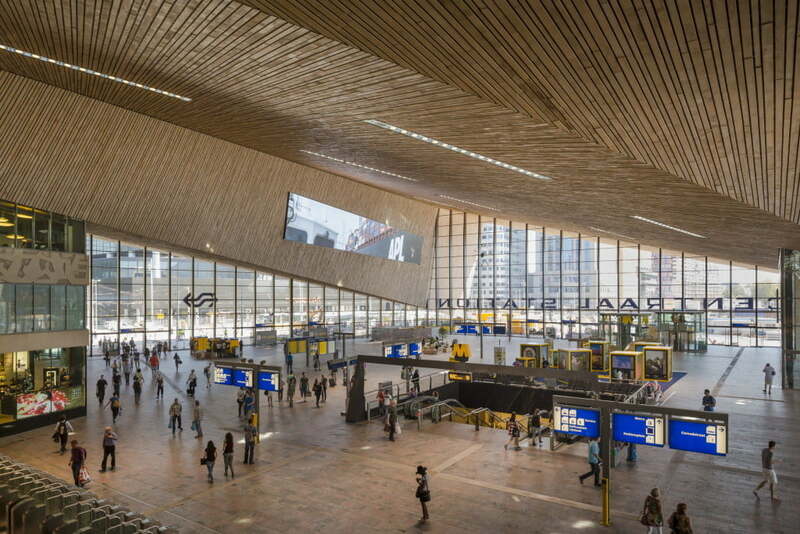 Hence the new station is not only larger, brighter and more orderly than the former, but also has an international feel; it beautifully complements both the efficiency of the Hi speed stop and the Rotterdam city’s bold ambitions for urban development and renewal. 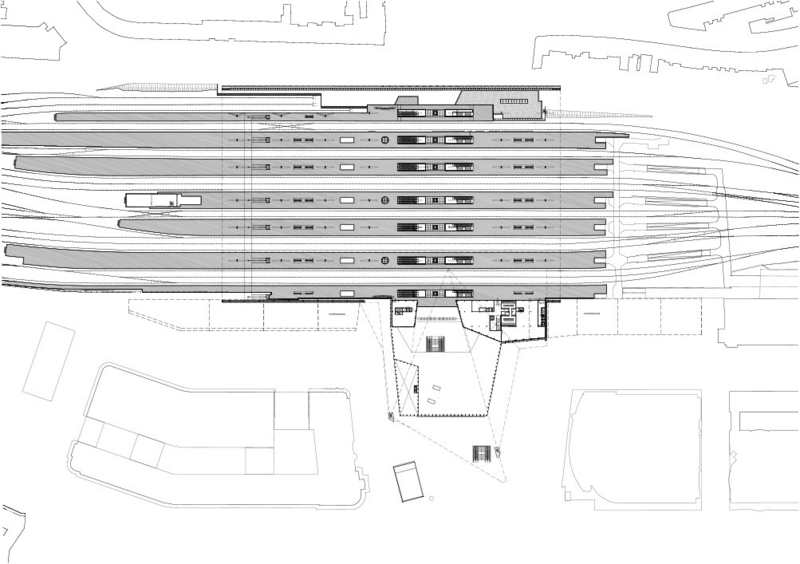 The station matches in all respects the practicality, capacity, comfort and allure, of the central transport terminal architecture of Madrid, Paris, London and Brussels. 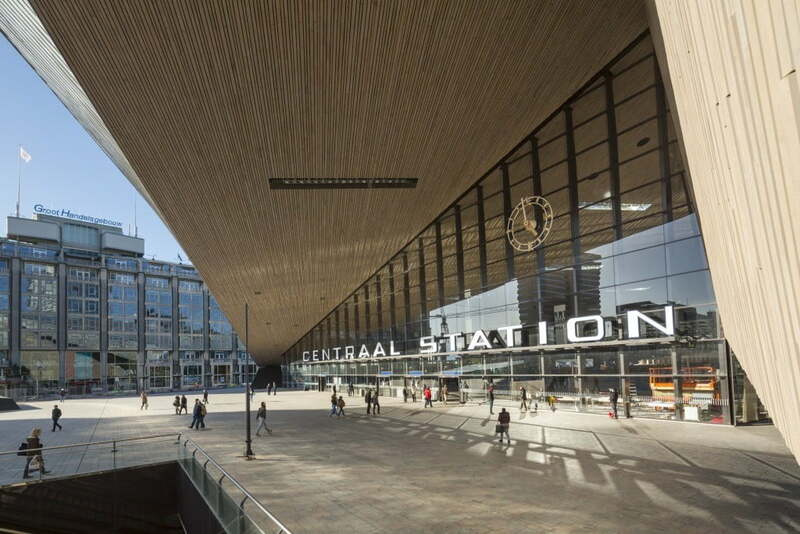 One of the fundamental challenges of Rotterdam Central transport terminal architecture was the difference in the urban character of the north and south side of the station. 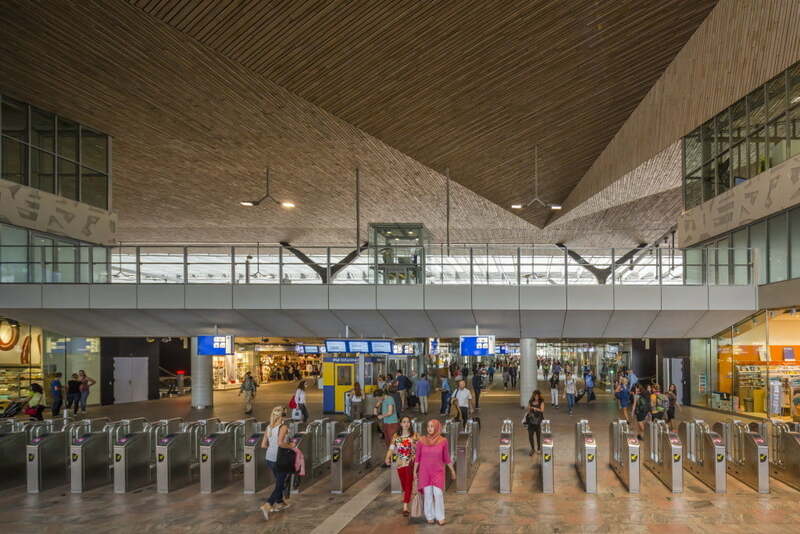 The entrance on the north side has a modest design, appropriate to the character of the neighborhood Provenierswijk and the smaller number of passengers. The entrance gradually connects to the city. In the Provenierswijk the character of the 19th-century Dutch provincial town is strengthened. 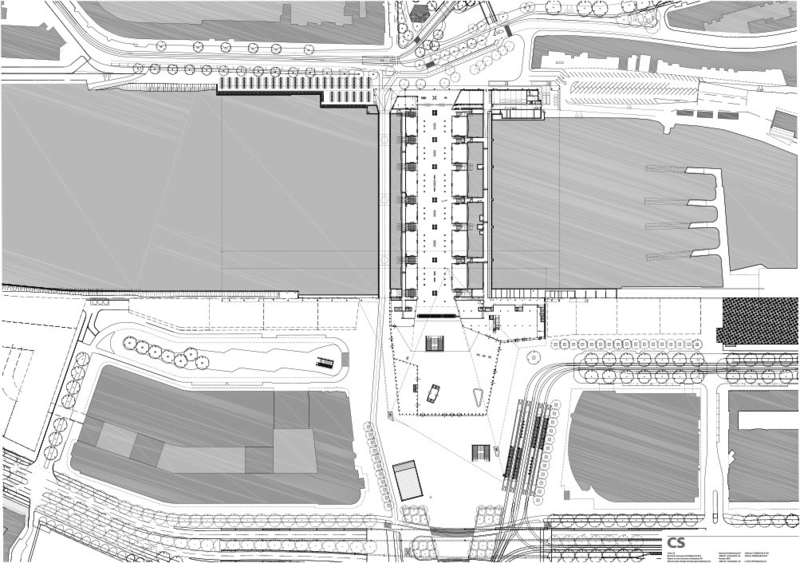 Large architectural extensions are avoided on this side of the station, the presence of green is ameliorated and the station is transparent. In contrast, the grand entrance on the city side is clearly the gateway to the high-rise urban center. 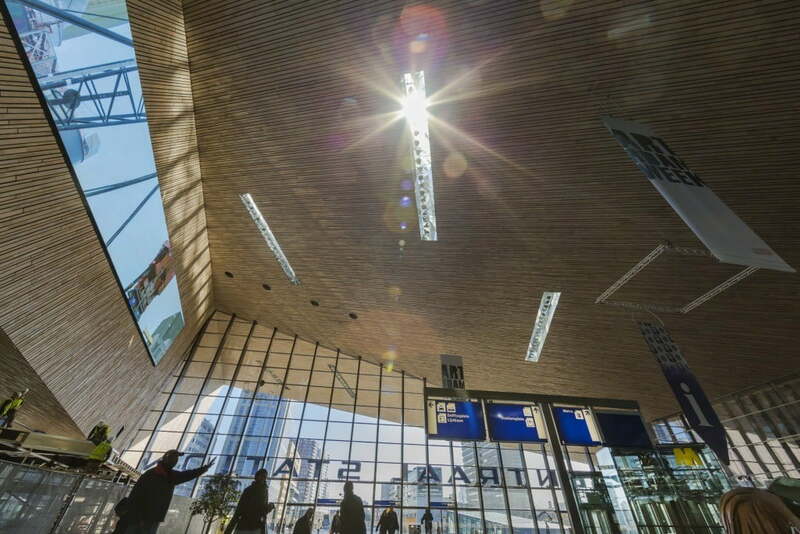 Here the station derives its new international, metropolitan identity from the hall made of glass and wood. The roof of the hall, fully clad with stainless steel, gives rise to building’s iconic character and points to the heart of the city. 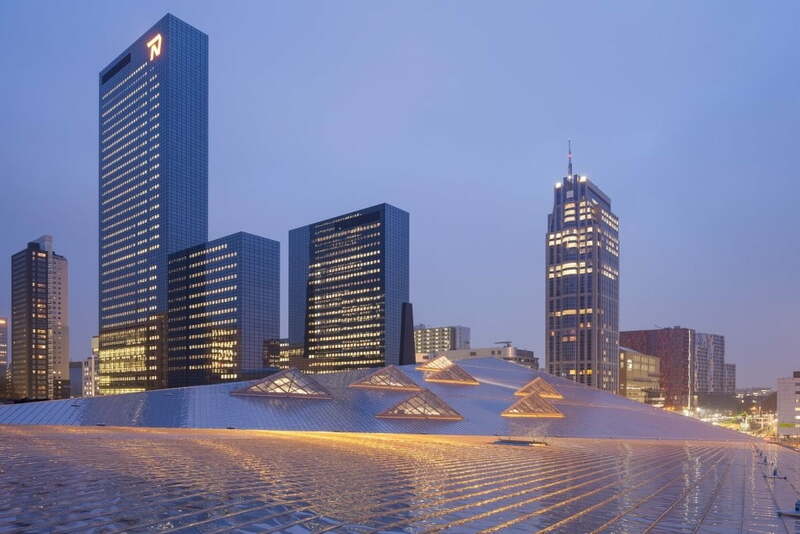 Now Rotterdam Central has the appropriate structure and dimensions for the urban landscape; it is in balance with the heights that characterize the metropolis and simultaneously reflects the human scale. 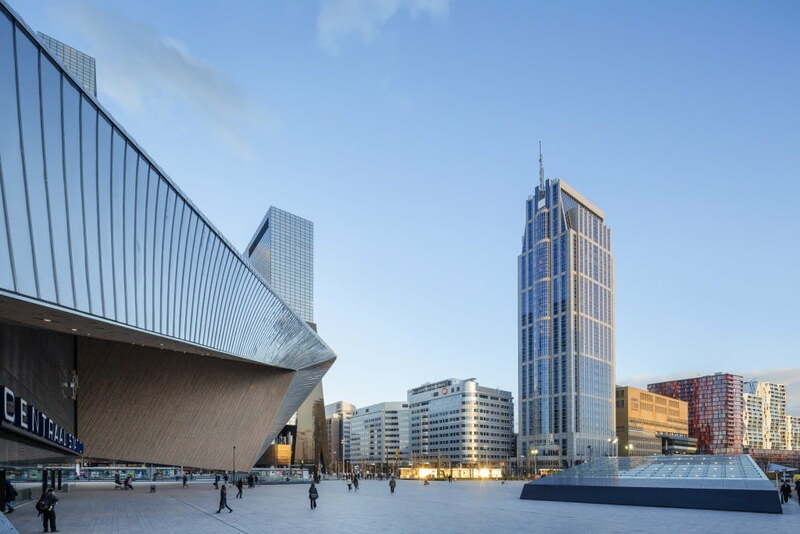 The city of Rotterdam is drawn to the new station via the compaction of the small-scale urban texture surrounding the public transport terminal. The entire railway zone becomes one with the city. This finer urban texture with new sight lines and a mixture of living and working will dramatically improve the quality of life and the environment of the station area. The esplanade in front of the station is a continuous public space. To achieve this simplicity a parking garage for 750 cars and a bicycle shed for 5,200 bicycles are located under the square. The tram station is moved to the east side of the station, so the platforms broaden the square. Bus, tram, taxi and the area for short-term parking are integrated into the existing urban fabric and do not constitute barriers. The red stone of the station floor continues into the forecourt, merging the station with the city. Pedestrian and cycling routes are pleasant and safe and arriving travelers now have dignified entrance to the city, free from traffic. 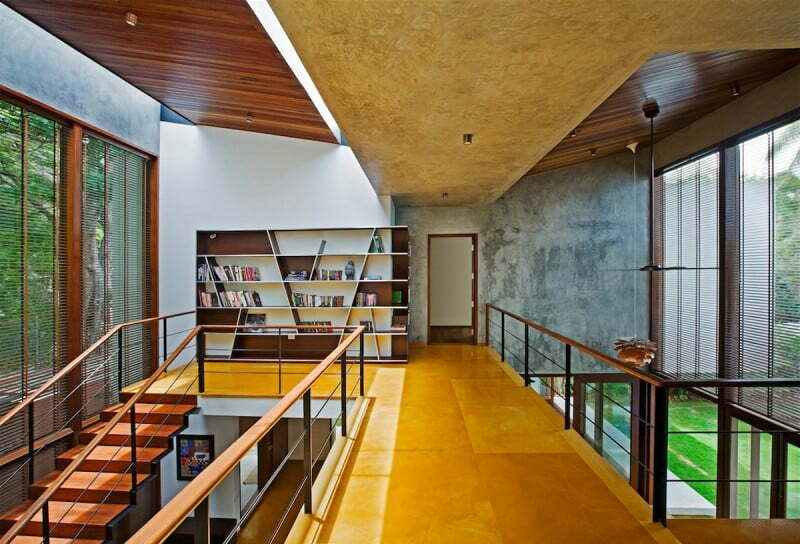 Incorporation of natural light, the warmth of the sun’s rays and a modern look are important elements in the design. The platform roof on the Proveniersside is transparent. When the train drives into the station, there is an almost tangible feeling of being enshrouded in the station building. 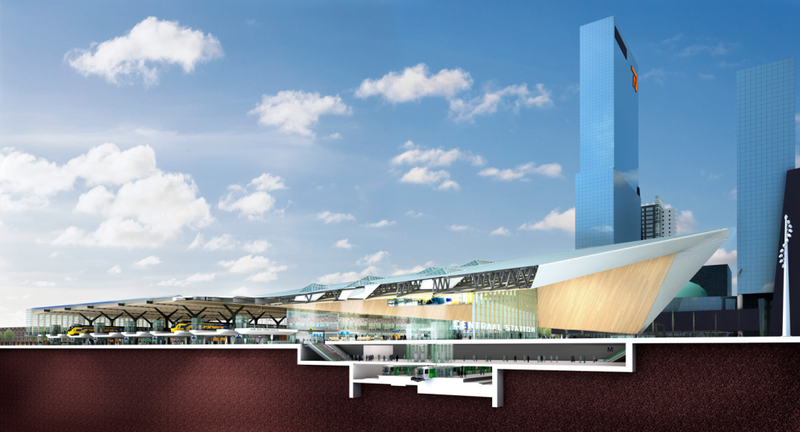 Upon entering in the bright high hall through the center side, the traveler gets an overview of the entire complex and a view to the trains that are waiting invitingly along the platforms. 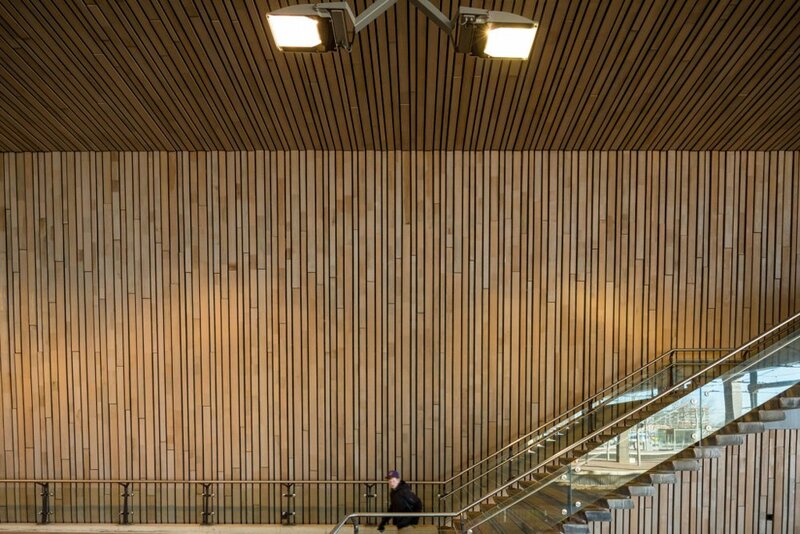 The wood finish on the inside of the hall, combined with the structural wooden beams of the platform roof creates a warm and welcoming ambiance, inviting visitors to linger. 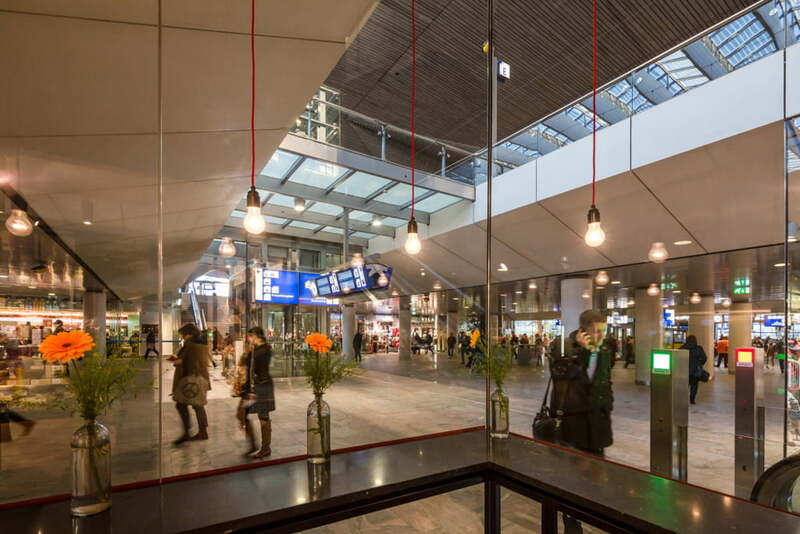 The largely transparent roof structure which covers all the tracks over a length of 250 meters, flood the platforms with light. 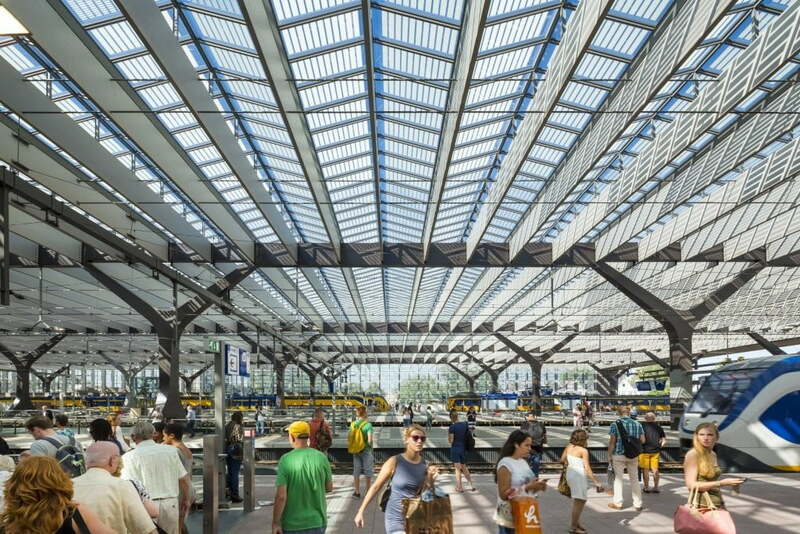 The glass plates of the roof vary the level of light transmittance by utilizing different solar cells patterns, which produce an ever-changing and fascinating play of shadows on the platforms. 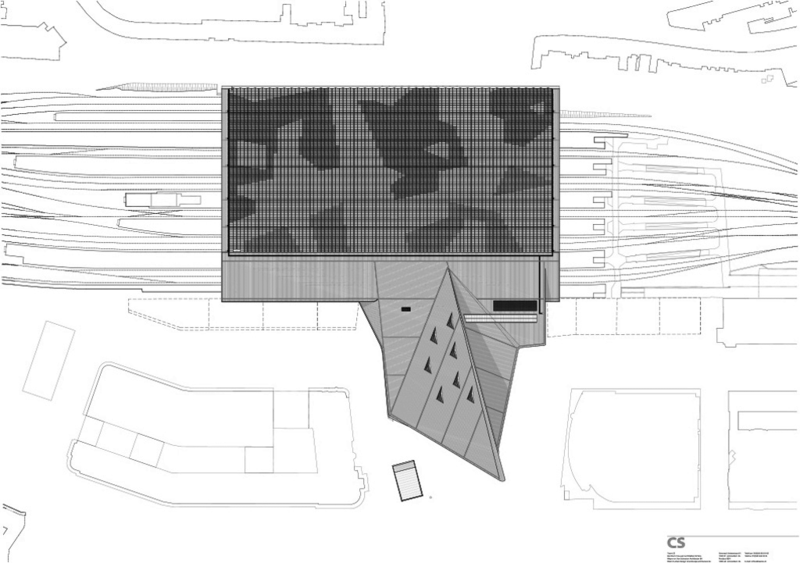 The routing through the station is logical; travelers are guided by a direct view of the trains and by the daylight that penetrates to the traveler’s passage via the voids that extend through the transparent roof platform and down to the stairs. 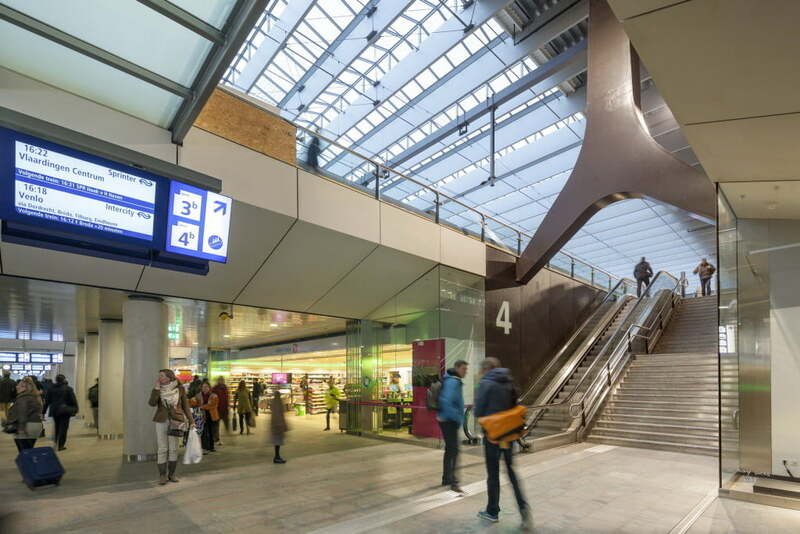 Because of its transparency the widened traveler’s passage, lined with commercial functions, forms a natural part of the station. Escalators, lifts and stairs lead up to the new platforms, which feature inviting and comfortable platform furniture. On the west side of the station there is a footbridge over the tracks for travelers in transit. This footbridge also functions as an escape route in the event of an emergency. 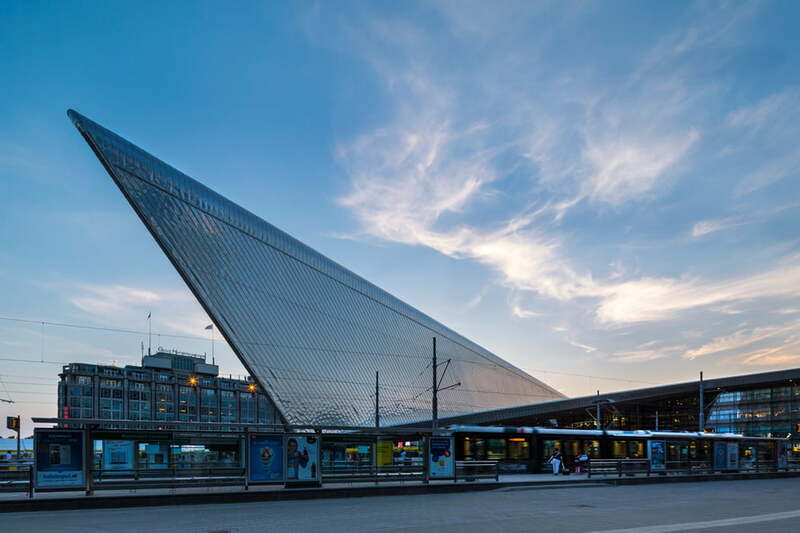 The passenger terminal is a national and international hub that connects train, tram, bus and subway. The public transport terminal is designed for passenger comfort, which is visible in the different zones of the station. 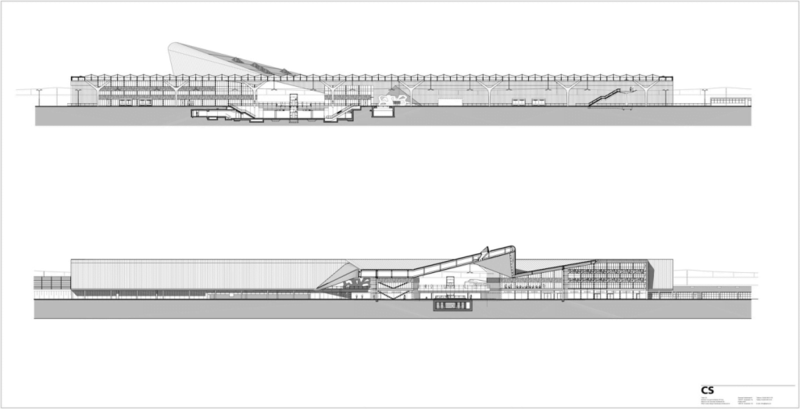 It includes commercial spaces, a lounge, restaurants, offices, parking for cars and bicycles. In the spacious concourse the passenger service functions are conveniently arranged. 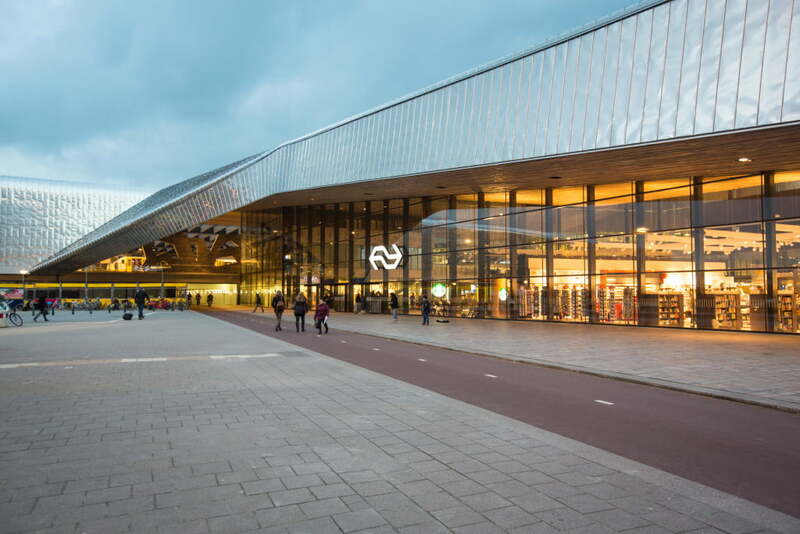 There is travel information, an information point, the Dutch Railways (NS) travelers shop, ticket vending machines and commercial functions. The grand café and the NS-lounge offer spectacular views across the hall and the adjacent tracks. Waiting areas in the hall and the passage are linked to the passenger flows, with areas both for browsing and quick shopping. 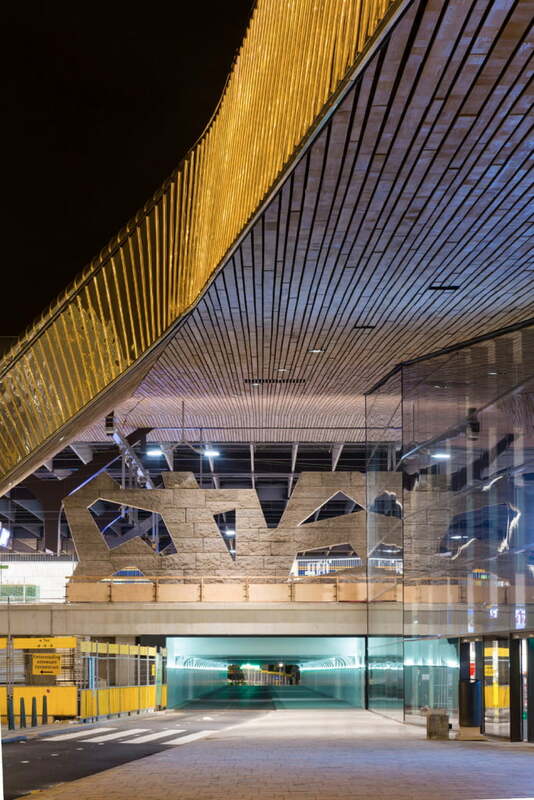 The new Rotterdam Central transport terminal architecture is a pleasant, open and transparent public transport terminal which functions as an iconic meeting point. 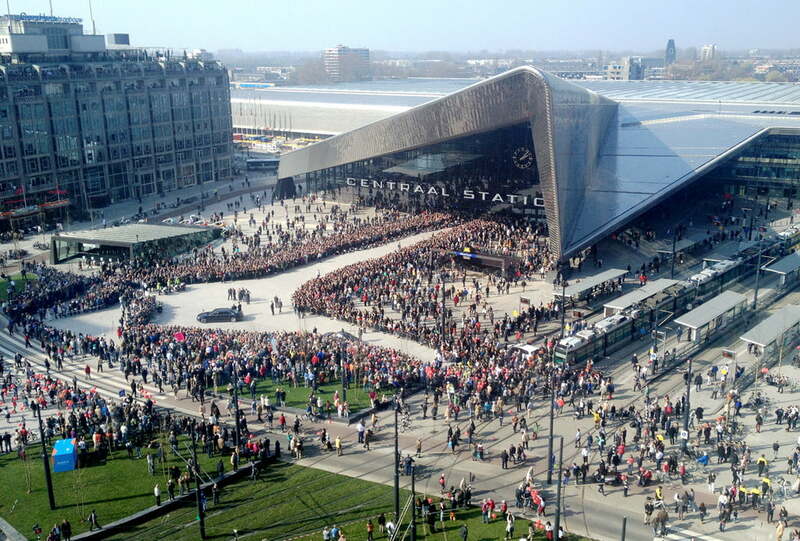 Interwoven into the urban network, the station connects the diverse characters of the city and marks the beginning of Rotterdam’s cultural axis. This modern and efficient building offers travelers to and from the port city all the amenities and comfort they could want or need in the present and the future. Windows with 130,000 solar cells cover 10,000 m2 of the total roof area of 28,000 m2. 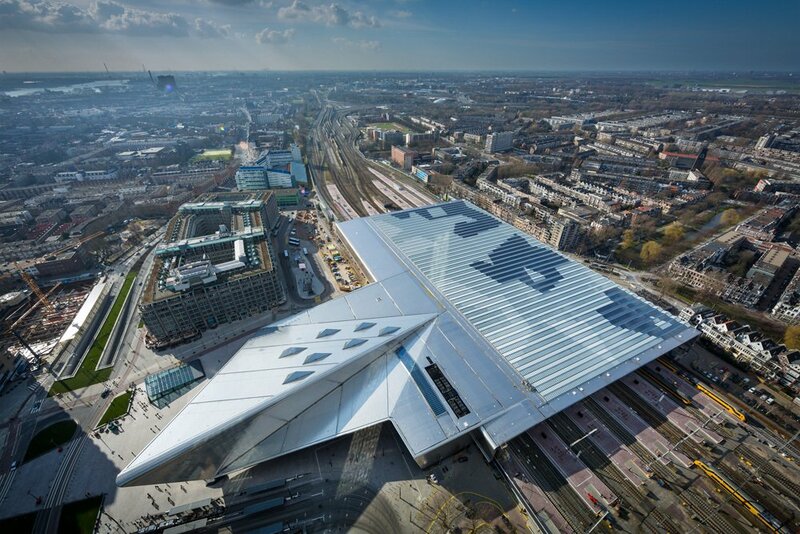 This is the largest application of solar energy in a station roof in The Netherlands and is also one of the largest rooftop solar projects in Europe. 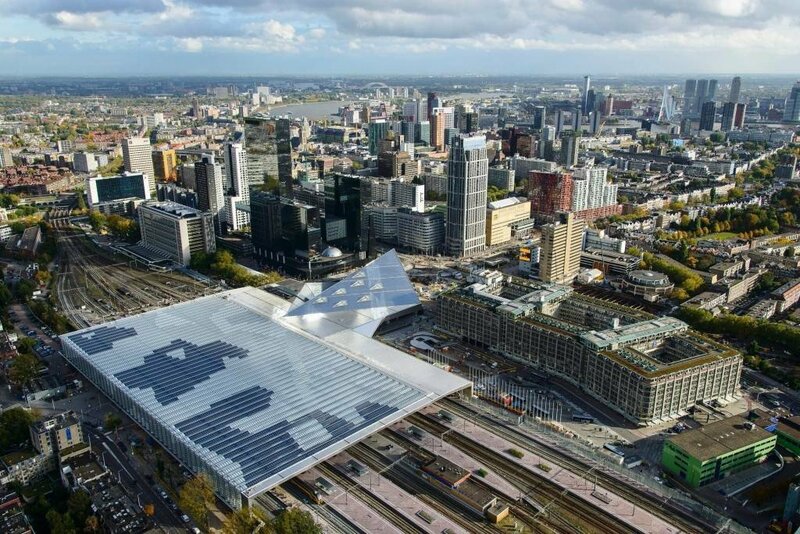 The solar cells are placed on the parts of the roof that get the most sun, taking into account the high buildings around Rotterdam Central. 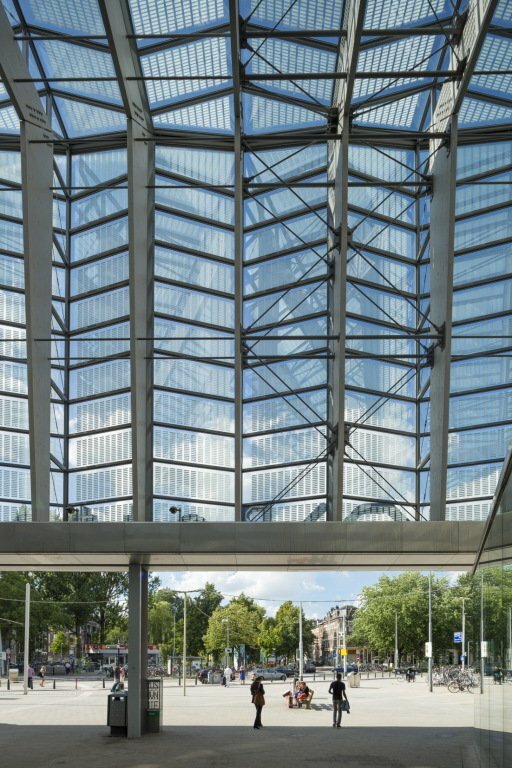 The glass panels vary in light transmittance by using different patterns in the solar cells. Where the roof has the greatest efficiency in terms of sunlight, the cell density is the highest. The solar cells that are integrated in the roof have a high degree of transparency, so there is ample light. The solar cells represent an 8% reduction in the station’s CO2 emissions. The cells are expected to generate 320 megawatt per year, which is enough energy for 100 households.